This table evaluates customers with Recency = 1 Month. It measures the likelihood of the customer buying in the next month by life-to-date orders. It's a derivation of the life-table methodology I've been talking about for a few weeks. 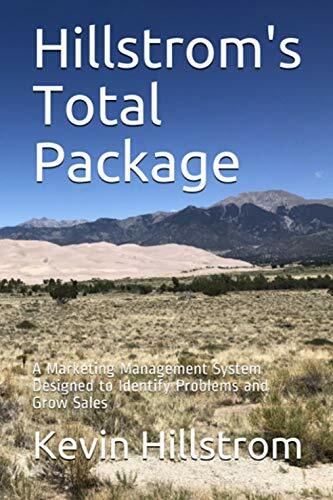 As one might expect, a customer with seven life-to-date orders is more responsive than a customer with one life-to-date order. This does not mean that the "opportunity" is with loyal customers. Where does the biggest improvement happen? Simple ... going from a first purchase to a second purchase. 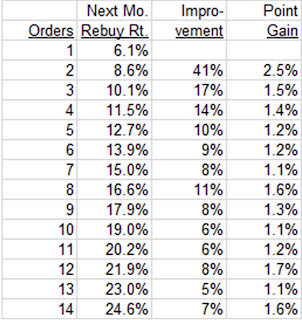 The change in incremental response (8.6% vs. 6.1%) is +41% ... far better than you obtain getting a customer to go from a 7th order to an 8th order (16.6% vs. 15.0% = +11%). 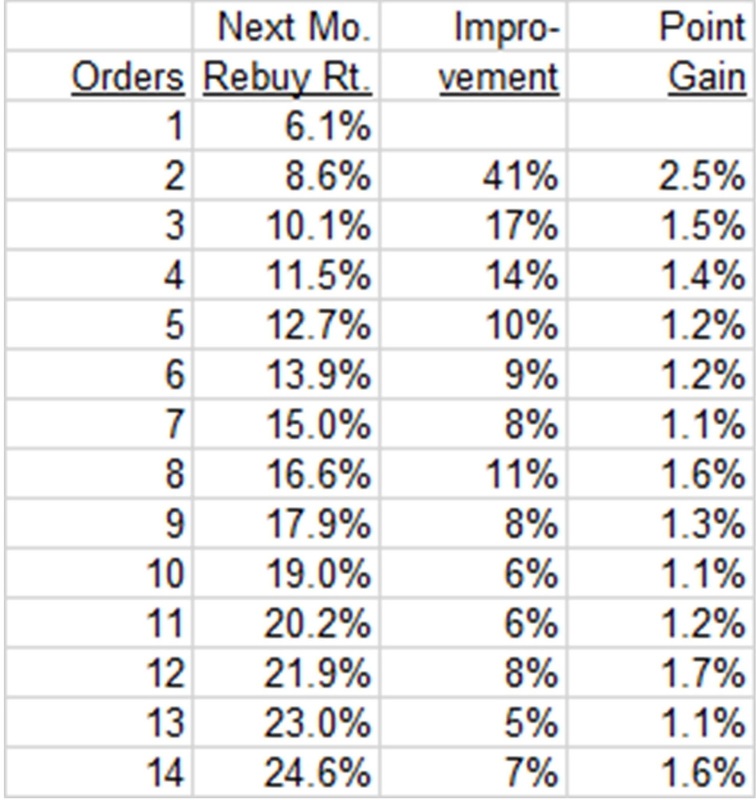 Look a the column labeled "Point Gain" ... 1st to 2nd order gets you a 2.5 point gain (8.6% - 6.1%) ... 7th to 8th order get you a 1.6 point gain (16.6% - 15.0%). You're reading more and more about "brands" that are pushing loyalty programs on customers, trying to get loyal buyers to become even more loyal. Can you generate profit here? Sure. Is this the best way to invest money in customer segments? Absolutely not. The place where you make the biggest difference is in converting a recent first-time buyer to a second purchase. This is where your Welcome Program pays off in spades. Spend your money where you make the biggest impact. There are two clever ways to end up with highly loyal buyers. Acquire more first-time buyers ... they'll eventually become loyal buyers. Quickly convert the first-time buyer via a Welcome Program. I keep sharing data (actual data, mind you) ... what's stopping you from taking action? Discuss.